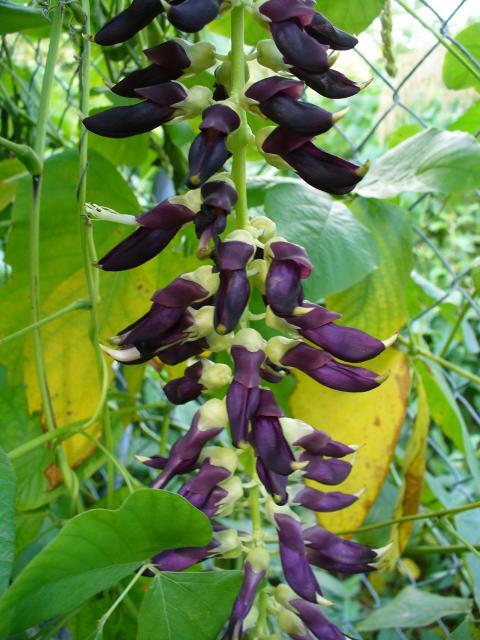 Velvet bean (Mucuna pruriens (L.) DC. var. utilis (Wall. ex Wight) Baker ex Burck) is a leguminous vine. It is annual or sometimes short-lived perennial. Velvet bean is vigorous, trailing or climbing, up to 6-18 m long (US Forest Service, 2011; Wulijarni-Soetjipto et al., 1997). It has a taproot with numerous, 7-10 m long, lateral roots. The stems are slender and slightly pubescent (Wulijarni-Soetjipto et al., 1997). The leaves are generally slightly pubescent, alternate, trifoliolate with rhomboid ovate, 5-15 cm long x 3-12 cm broad, leaflets (US Forest Service, 2011; Wulijarni-Soetjipto et al., 1997). The inflorescence is a drooping axillary raceme that bears many white to dark purple flowers. After flower pollination, velvet bean produces clusters of 10 to 14 pods. They are stout, curved, 10-12.5 cm long, with between two and six seeds, covered with greyish-white or orange hairs that may cause irritation to the skin (US Forest Service, 2011). 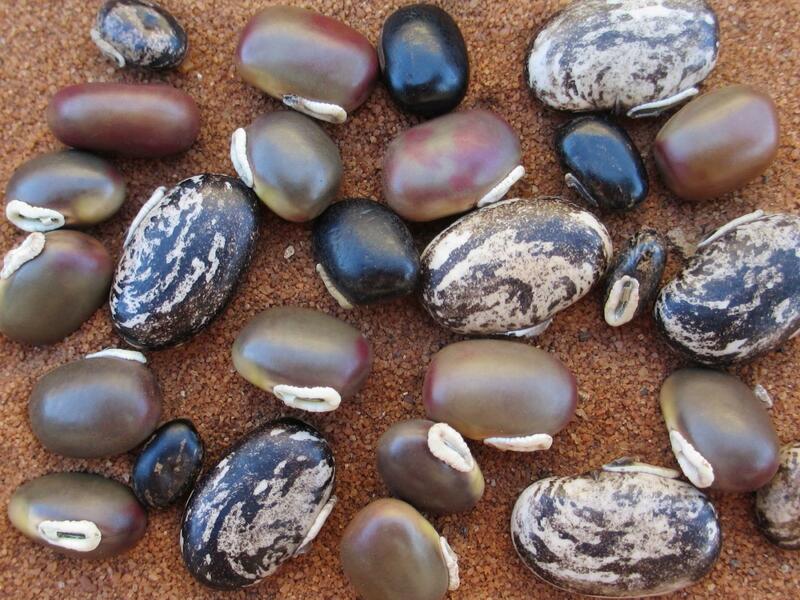 The velvet bean seeds are variable in colour, ranging from glossy black to white or brownish with black mottling. Seeds are oblong ellipsoid, 1.2 to 1.5 cm long, 1 cm broad and 0.5 cm thick (FAO, 2011; US Forest Service, 2011; Wulijarni-Soetjipto et al., 1997). 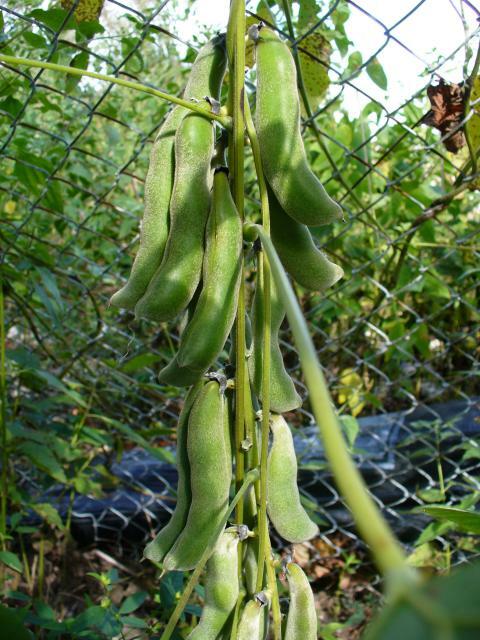 Velvet beans have three main uses: food, feed (forage and seeds) and environmental services. The young leaves, pods and seeds are edible and used in several food specialties including "tempeh", a fermented paste made of boiled seeds, originally from Indonesia. In Central America velvet bean is also used as a coffee substitute (Eilittä et al., 2003). The plant can be a cover crop, and provides fodder and green manure. In the USA, velvet bean is also used as an ornamental species (Wulijarni-Soetjipto et al., 1997). There are numerous cultivars of velvet bean in the world (FAO, 2011). Velvet bean is a valuable fodder and feed legume. Vines and foliage can be used as pasture, hay or silage for ruminants while pods and seeds can be ground into a meal and fed to both ruminants and monogastrics (Chikagwa-Malunga et al., 2009d; Eilittä et al., 2003). Pods with their seeds can be ground into a rich protein meal and can be fed to all classes of livestock though in limited amounts in monogastrics (Chikagwa-Malunga et al., 2009d). Velvet bean originated from southern Asia and Malaysia and is now widely distributed in the tropics (FAO, 2011). It was introduced to the southern states of the USA in the late 19th century and from there was reintroduced to the tropics in the early part of the 20th century (Eilittä et al., 2003). Velvet bean is found from sea level up to an altitude of 2100 m (Ecocrop, 2011). It requires a hot moist climate with annual rainfall ranging from 650 to 2500 mm and a long frost-free growing season during the wet months. It can grow on a wide range of soils, from sands to clays but thrives on well-drained, light textured soils of appreciable acidity (FAO, 2011; Pengelly et al., 2004). Many treatments have been proposed to decrease the content in antinutritional factors of the seeds, such as boiling in water for one hour, autoclaving for 20 minutes, water-soaking for 48 h and then boiling for 30 minutes, or soaking the cracked seeds for 24 h in 4% Ca(OH)2 (Cook et al., 2005; Pugalenthi et al., 2005). Velvet bean is suitable in intercropping systems where it is grown with maize (Cook et al., 2005), pearl millet, sorghum or sugarcane for support (Göhl, 1982). The crop gives reliable yields in dry farming and low soil fertility conditions that do not allow the profitable cultivation of most other food legumes (Buckles et al., 1998). Velvet bean yields range from 10 to 35 t green material/ha and from 250 to 3300 kg seeds/ha depending on the cultivation conditions (Ecocrop, 2011). Harvesting of velvet bean pods can start as soon as they start turning from green to dark brown or black; in Malaysia this is possible 215 to 255 days after sowing. Pods are harvested by hand (Wulijarni-Soetjipto et al., 1997). Animals can enter the sward after the pods have matured. In Hawai, grazing 170 to 220 days after sowing resulted in yields of 19 t/ha of green forage and 3.85 t/ha of seeds (Takahashi et al., 1949 cited by FAO, 2011). 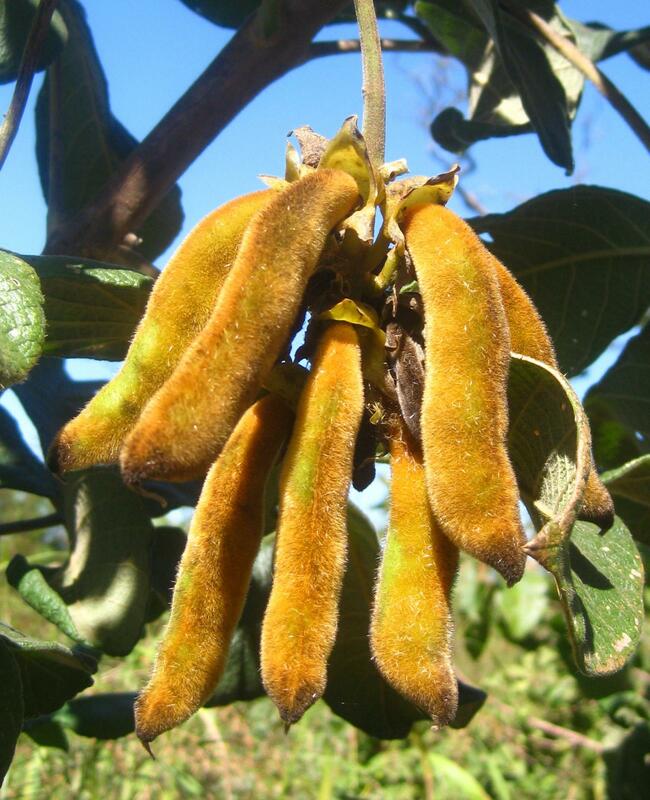 When velvet bean is intended for forage, it may be harvested when the pods are still young, usually between 90-120 days after sowing (Wulijarni-Soetjipto et al., 1997; Ravindran, 1988). Harvesting at about 120 days after planting resulted in the best combination of biomass yield and nutritive value (Chikagwa-Malunga et al., 2009a). In Malaysia, the first harvest for fodder can be done 2 months after sowing. A cutting interval of 5 weeks and cutting at a height of 30 cm provides a reasonable yield of forage of adequate quality (Wulijarni-Soetjipto et al., 1997). Yields of green fodder may be up to 20-35 t/ha resulting in 8.2-16.4 t DM/ha (Ecocrop, 2011). Because of its dense matted growth, velvet bean is difficult to harvest and cure for hay (FAO, 2011). Yields of hay average 2.8-3.6 t/ha (Ecocrop, 2011). Velvet beans may be cultivated for silage, but they are hard to harvest and flail-type harvesters do a better job than mowing machines. Velvet bean can be grown in mixture and ensiled in combination with a grain crop, maize being the usual choice but sorghum is also a possibility, or with grasses such as Napier grass (Contreras-Govea et al., 2009; Mbuthia et al., 2003). However, because velvet beans are diffcult to harvest, it is also recommended to grow them and the companion crop separately and then mixing when ensiling (FAO, 2011). The main attributes of velvet bean are its fast growth and its long growing season in frost-free environments. It is thus possible for velvet bean to protect the soil through the wet monsoon season (FAO, 2011; Cook et al., 2005). Velvet bean is an N-fixing legume that has no specific rhizobium requirements, but N fixation is favoured by warm temperatures (FAO, 2011). As a leguminous species velvet bean is reported to improve soil fertility: it provides more than 10 t DM aboveground biomass/ha, and below ground it fixes some 331 kg N/ha, equivalent to 1615 kg ammonium sulfate/ha (Cook et al., 2005; Buckles et al., 1998; Wulijarni-Soetjipto et al., 1997). Velvet bean also yields 100 kg K/ha, and 20 kg P/ha (Buckles et al., 1998). It is widely grown in Central America, either relay planted with maize or as a rainy season fallow crop in rotation with dry season maize. It was reported to improve maize yield by between 500 kg and 2 t/ha after a one-year fallow (ILRI, 2004; Wulijarni-Soetjipto et al., 1997). Velvet bean is mainly grown as a cover crop and green manure because it can establish very quickly without requiring complete soil preparation (Cook et al., 2005). In intercropping systems including maize and velvet bean, the fast growing legume accumulates nutrient through N fixation and it protects the soil from heavy rains in the wet season. Once slashed into a thick mulch, the velvet bean foliage protects the soil from erosion and prevents weed germination. Velvet bean also has a positive effect on soil moisture (Buckles et al., 1998). As a cover crop, velvet bean sown in rubber plantations can yield about 2 t/ha of fresh organic matter within 6 months (Wulijarni-Soetjipto et al., 1997). In Sri Lanka, it has been planted as a cover crop in coconut plantations (Ravindran, 1988). It used to be an important cover crop in citrus and banana plantations (Wulijarni-Soetjipto et al., 1997). Velvet bean has an overall beneficial effect on companion crops in intercropping systems due to its pest and disease resistance. When established, the crop smothers weeds effectively (FAO, 2011). Velvet bean is one of the most suitable crops for reclaiming land infested with weeds, notably Cynodon dactylon, Cyperus species, Saccharum spontaneum and Imperata cylindrica (Hellin, 2006; Wulijarni-Soetjipto et al., 1997). In Brazil, it is recommended for use in rotation with cotton to limit Fusarium oxysporum infestation. It can also effectively control nematode infestation by species such as Meloidogyne incognita (Wolf et al., 2003; Wulijarni-Soetjipto et al., 1997). Velvet been forage contains 15-20% protein (DM basis) (Sidibé-Anago et al., 2009). Seeds are rich in protein (24-30%), starch (28%) and gross enery (10-11 MJ/kg) (Pugalenthi et al., 2005; Siddhuraju et al., 2000). They also contain desirable amino acids, fatty acids and have a good mineral composition (Vadivel et al., 2007). The main problems with velvet bean seeds, notably in monogastric animals, are the various antinutritional factors they contain (see Potential constraints below). Most toxicological problems with velvet bean are due to its seeds. Velvet bean seeds and, to a smaller extent stems and leaves, contain two important non-protein amino-acids: L-dopa from which dopamine, a potent anti-Parkinson disease agent, is prepared, and DMP (dimethyltryptamine), an hallucinogenic substance. L-dopa content varies from 1.6 to 7% (Cook et al., 2005; Wulijarni-Soetjipto et al., 1997). Ensiling decreased L-dopa content in the seeds by 10-47% (Matenga et al., 2003). L-dopa is a potent antinutritional factor (Siddhuraju et al., 2002) and may cause severe vomiting and diarrhoea in pigs fed large quantities of velvet bean seeds. It is less harmful in ruminants: it does not appear to modify rumen fermentation and there is a rumen microbial adaptation to L-Dopa (Chikagwa-Malunga et al., 2009b). Trials in sheep and goats fed velvet beans and pods did not find that L-dopa had any adverse effects (Matenga et al., 2003; Castillo-Camaal et al., 2003a; Pérez-Hernandez et al., 2003; Castillo-Camaal et al., 2003b; Mendoza-Castillo et al., 2003). Velvet bean seeds contain a number of alkaloids, notably mucunain, prurienine and serotonin. Mucunain is produced by pod hairs. It causes severe itching to the skin, and the hairs coming in contact with the eyes can be very painful. L-dopa may also be implicated in skin eruptions (Pugalenthi et al., 2005). The negative effects of mucunain are potentialized by serotonin (Cook et al., 2005). It has been reported that haemorrhage and death can result from cattle eating the hairy pods (Miller, 2000). Pod hairs have the same anthelmintic efficacy as piperazine against ascariasis in buffalo calves (Behura et al., 2006). Trypsin and chymotrypsin-inhibiting activities decrease protein digestibility, induce pancreatic hypertrophy and hyperplasia, increase trypsin secretion and, therefore, reduce N retention, growth and feed conversion (Pugalenthi et al., 2005; van Eys et al., 2004; Rackis et al., 1986). Phytate content is relatively high in the seeds and may reduce mineral and protein availability (Pugalenthi et al., 2005). Oligosaccharides (mainly verbascose) cause flatulence (Pugalenthi et al., 2005). HCN is found in velvet bean seeds, but in amounts well below (5.8 mg/100g) the lethal dose (35 mg/100g) (Pugalenthi et al., 2005). Lectins and saponins are also found (Pugalenthi et al., 2005). These antinutritional factors can be efficiently reduced by a wide range of treatments (see Processes on the "Description" tab). Both meat and milk production can benefit from including legumes such as velvet bean forage and pods in feeds (Pengelly et al., 2004). Pasture is the most important use of velvet bean. It is never fully grazed by stock until it is well matured or frosted. It makes rather poor hay, especially if cut when mature, as the leaves are easily shed; also, the long vines are difficult to handle. Good silage can be made from velvet bean together with its supporting crop. It usually turns black after a time, but without impairing its quality (Göhl, 1982). Maize cultivated with velvet bean can be ensiled without any adverse effect on silage quality (Contreras-Govea et al., 2009). In Honduras, farmers developed over several years a valuable maize cropping system combined with velvet beans (Buckles et al., 1999). Ruminants can also be fed pods and seeds. It is more economical to grind the whole pods rather than to separate the pods and the seeds (Göhl, 1982). Velvet bean forage was found to be an interesting feed for ruminants even in areas with low-fertility soils and a short rainy season. Zebu cows and heifers fed low quality hay ingested 61.8 to 76 g/kg W0.75 of velvet bean hay (Sidibé-Anago et al., 2009). In Zimbabwe, it proved to be a cost-effective forage legume for growing cattle on natural rangeland (veld): the animals gained weight when supplemented with velvet bean hay at 1.5% BW or more (+ 20 kg in 3 months at 2% BW), and lost weight when not supplemented or supplemented at 1% BW (-40 kg and -20 kg respectively). In pen-fattened animals, velvet bean hay replaced the commercial concentrate, and a diet of maize grain and velvet bean hay (5:3 ratio) plus ad libitum access to maize stover gave similar weight gain as the control diet (Murungweni et al., 2004). 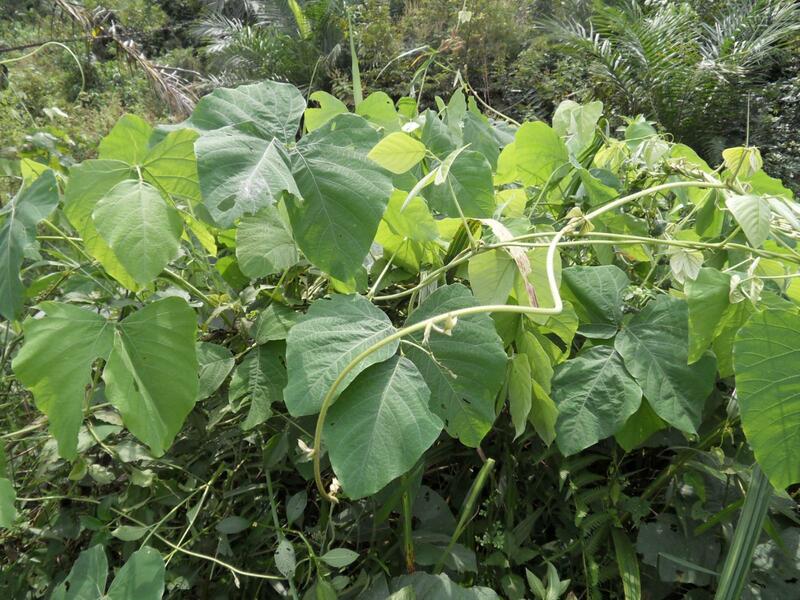 When compared to other legumes (Gliricidia sepium, Lablab purpureus and Clitoria ternatea), fresh velvet bean forage resulted in lower (Mureithi et al., 2003) or identical milk yield (Juma et al., 2006), but another comparison with Gliricidia in similar conditions resulted in higher milk yield for velvet bean forage (Muinga et al., 2003). A velvet bean hay-based diet gave higher milk yield than a lablab hay-based diet, but Jersey cows eating either diet produced good quality milk that met the expected minimum market standards (Murungweni et al., 2004). When cultivated in association with maize, velvet bean forage increased the protein content of the mixture, but did not increase the milk yield of dairy cattle (Armstrong et al., 2008). Velvet bean hay can significantly benefit smallholder farmers who rely on cattle as draught power. It is necessary for such farmers to supplement their animals during the dry winter season if they are to retain the draught capacity of the animals for the following season (Murungweni et al., 2004). In young rams, velvet bean hay caused metabolic disorders (diarrhoea) if given in excess of 2.6% of the body weight. Feeding velvet bean hay offered in the morning at 2.5% body weight, and poor-quality roughage such as wheat bran or maize stover offered in the afternoon was found to be a workable diet (Murungweni et al., 2004). Other trials have focused on the supplementation of forage diets with velvet bean seeds and pods. Velvet beans were able to support growth and milk production, and improved performance when compared to grazing or grass-only diets. They also compared favourably with other supplements, though they gave poorer results in some trials. However, no adverse effects were recorded (Castillo-Camaal et al., 2003a; Pérez-Hernandez et al., 2003; Castillo-Camaal et al., 2003b; Chikagwa-Malunga et al., 2009c; Mendoza-Castillo et al., 2003; Matenga et al., 2003). The addition of a small quantity of molasses may improve consumption (Matenga et al., 2003) and reduce dustiness (Pérez-Hernandez et al., 2003). The relatively high protein and energy value of velvet bean seeds make them a suitable feed for pigs (Pugalenthi et al., 2005). In some cases, pigs are allowed to graze velvet bean pastures to consume the beans that have been left behind after harvesting (Göhl, 1982). However, the use of velvet bean seeds is limited by their deficiency in sulphur-containing amino acids (Pugalenthi et al., 2005), and by the presence of numerous antinutritional and toxic factors (see Potential Constraints above). Feeding raw seeds can result in deleterious effects on pig performance as well as their blood constituents (Sridhar et al., 2007). Pigs should not be allowed to consume large amounts of velvet bean, either as forage or seeds (Göhl, 1982). Various maximum inclusion rates have been reported: some authors claimed that velvet beans can be included at up to 25% of the diet, while others found that such a high rate may cause severe vomiting and diarrhoea, and proposed 5% as a much safer level. The incorporation of 15% of raw velvet beans in pig feeding caused 50% mortality in young animals (Emenalom et al., 2004). In all circumstances processing of velvet bean seeds is necessary in order to be able to use them safely in pig feeds. Boiled seeds included at 25% could satisfyingly replace maize in a diet for 40 kg pigs (Lizama et al., 2003). A more extensive process, consisting of cracking the seeds, soaking them in water for 48 h and boiling them for 1 hour allowed the use of up to 40% seeds in the diets of 15-35 kg pigs. This treatment also allowed full replacement of the soybean meal while maintaining growth rate (341-351 g/d) and feed conversion ratio (2.53-2.58) (Emenalom et al., 2004). While proximate composition of velvet bean seeds makes it tempting to use them in poultry diets, the presence of antinutritional factors limits their practical interest, unless appropriate technological treatments are found (Carew et al., 2006). Raw velvet bean seeds should be avoided in broiler diets. Processed seeds (dry roasting or soaking + boiling) can be included at up to 10% of the diet with an adapted feed formulation, but even processed seeds should be used carefully and probably avoided for starter animals. Performance is markedly reduced in broilers fed raw velvet beans (Harms et al., 1961; Ferriera et al., 2003; Emiola et al., 2007; Emenalom et al., 2005b; Tuleun et al., 2008a). This reduction can occur at low levels of incorporation: 5% raw velvet beans can induce a 25% drop in animal performances (Iyayi et al., 2006b). Significant mortality rates can be registered at high levels of inclusion (Harms et al., 1961; Del Carmen et al., 1999). The effects were similar in Guinea fowl (Dahouda et al., 2009a). Velvet beans appear to be more detrimental to growth than to feed intake, although results differ among authors (Trejo et al., 2004; Emiola et al., 2007; Tuleun et al., 2008a, etc.). The feed conversion ratio is always markedly reduced. Treatments, and particularly heat treatments, can help to reduce the negative effects of velvet beans (Carew et al., 2006). However, performance is seldom completely restored compared to control diets even if differences can be statistically non-significant at lower inclusion rates. The main treatments that have been tested include: soaking (with or without additives in water), boiling, autoclaving, dry roasting and combinations of these techniques. These treatments help to decrease the levels of antinutritional factors such as antitryptic factors, L-dopa, tannins and hemagglutination factors (Vadivel et al., 2011). Dry roasting has been found to be an efficient way to limit the negative effects of velvet beans in broilers and Japanese quails (Del Carmen et al., 1999; Emiola et al., 2007; Ukachukwu et al., 2007b; Tuleun et al., 2009a). However other authors compared various treatments and found roasting less efficient than boiling in broilers and in Guinea fowls (Emenalom et al., 2005b; Dahouda et al., 2009a). Regarding wet treatments, soaking alone (in water with or without additives) is not efficient (Nyirenda et al., 2003; Tuleun et al., 2010b; Vadivel et al., 2011), therefore, it should be combined to a heat treatment such as boiling or autoclaving. The duration of thermal treatments can have an effect on their efficiency: boiling velvet bean seeds for 20 minutes resulted in lower growth rates than boiling for 40 or 60 min (Tuleun et al., 2008a). For several authors, the optimal treatment consisted of soaking in water or sodium bicarbonate, followed by boiling (60 to 90 min) and drying. This procedure was found to eliminate antinutritional factors efficiently (Vadivel et al., 2011) and broiler performance was maintained at up to 10-20% inclusion of velvet beans in the diet (Ukachukwu et al., 2003; Akinmutimi et al., 2006; Emenalom et al., 2006; Ukachukwu et al., 2007a; Ani, 2008; for Guinea fowls: Farougou et al., 2006). However, even roasted and soaked + boiled seeds can reduce performance at low inclusion rates (6-10%) (Emenalom et al., 2005a; Iyayi et al., 2003; Vadivel et al., 2011). Thermal treatment also improved protein digestibility, probably by inactivation of the antinutritional factors: for example 1 h dry exposure at 100°C increased protein digestibility from 65% to 74% (Iyayi et al., 2008). Using velvet bean seeds, even when processed, is not recommended in commercial egg production though economic considerations may make them profitable. The use of raw velvet bean seeds in layer diets can result in a marked reduction in performance. Daily egg production dropped from 78.5% to 65.5% with 12.5% raw seeds in the diet (Harms et al., 1961), and from 84% to 38% with 20% inclusion (Tuleun et al., 2008b). Treatment reduce the negative effects of velvet bean seeds, but did not enable the same performance as control diets with lower levels of velvet bean seeds: in laying hens, the best treatment (toasting) allowed 74% hen-day egg production vs. 84% from the control diet with 20% velvet bean seeds, while boiled seeds yielded 59% hen-day egg production (Tuleun et al., 2008b). In laying Japanese quails, 15% toasted seeds caused a significant reduction in performance, but the lower feed cost per egg produced, and feed cost per bird, justified using velvet bean seeds (Tuleun et al., 2010b). Egg composition and quality were not affected by the inclusion of velvet bean seeds (Iyayi et al., 2003; Tuleun et al., 2008b). Velvet bean seed meal and velvet bean leaves can be fed to rabbits. Seeds and leaves can be fed together to rabbits, resulting in higher intake, increased diet digestibility and higher growth rates (208 g/week vs. 67 g/week on a basal diet) (Aboh et al., 2002). Up to 20% cooked velvet bean seed meal can be included in the diet of weaned rabbits (Taiwo et al., 2006). Velvet bean leaves compared favourably with soybean meal and gave similar daily weight gains (15 g/day vs. 16 g/day) (Bien-Aimé et al., 1989). Velvet bean seeds, like other tropical legume seeds, are a potential feed ingredient for fish diets, due to their high protein and carbohydrate content, which make them a potential substitute for fish meal and cereals (Ogunji et al., 2003). However, their use is limited by the presence of antinutritional factors and by an amino acid profile that does not meet the requirements of fish (Ogunji et al., 2003). Heat treatments as well as supplementation with other protein sources are therefore required (Hertrampf et al., 2000; Ogunji et al., 2003). Low inclusion rates (5%) of raw velvet bean seeds were recommended in juveniles of African catfish (Clarias gariepinus) (Aderolu et al., 2009). In tilapia diets, it was possible to replace up to 25% of the dietary protein with soaked and autoclaved velvet bean seeds (Siddhuraju et al., 2003). For common carp (Cyprinus carpio), the level of L-Dopa should not be higher than 7 g/kg in the diet. The level of raw or processed velvet bean seeds should not exceed 20% as it has deleterious effects on growth rate and feed utilisation (Siddhuraju et al., 2001; Siddhuraju et al., 2002). Flores, M., 1992. El Uso del Frijol de Abono (Mucuna Spp.) Como Cultivo de Cobertura en Plantaciones de Cítricos. Informe Tecnico, 7. CIDICCO (Centro Internacional de Información Sobre Cultivos de Cobertura), Honduras. Hertrampf, J. W.; Piedad-Pascual, F., 2000. Handbook on ingredients for aquaculture feeds. Kluwer Academic Publishers, 624 pp. Prasad, S. K. ; Qureshi, T. N. ; Qureshi, S., 2008. Mucuna pruriens seed powder feeding influences reproductive conditions and development in Japanese quail Coturnix coturnix japonica. Animal, 3 (2): 261-268. Ukachukwu, S. N. ; Obioha, F. C., 2007. Effect of processing methods on the nutritional value of Mucuna cochinchinensis to broiler chicks. Aust. J. Exp. Agric., 47 (2): 125-131. Ukachukwu, S. N., 2007. Optimum inclusion and replacement value of boiled Mucuna cochinchinensis for soybean meal in broiler diets. Aust. J. Exp. Agric., 47 (6): 672-676.